Ric Hall submitted the following information relating to the RCMP pennons attached to Force lances. Many current members assume that the Force lances had only red and white pennon. As the photograph below illustrates, other coloured pennons were used before they were standardized in the 1960s. 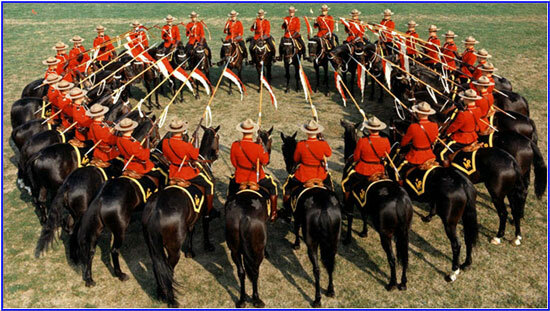 The Musical Ride became a permanent entity of the RCMP in 1961. At this time, the Ride became an annual performance. Up to 1961 it had been impossible to plan performances far in advance, as there had always been doubts about whether or not the Ride would continue. From 1921 to 1939, Musical Rides were performed in other areas of Canada where there were available horses and recruits such as: Ottawa, “K” Division (Alberta), “E” Division (Vancouver), and Depot Division (Regina). The “E” Division members put on Musical Ride demonstrations in 1934, 1935, 1936, & 1937 while the “K” Division members conducted a Musical Ride performance in 1934. 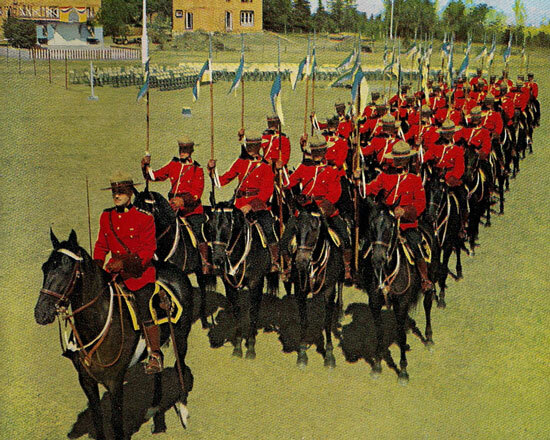 According to the late Veteran Ralph Cave, “Depot” Division used the blue and yellow pennons.” The Musical Ride based in Ottawa would use the red and white pennons. 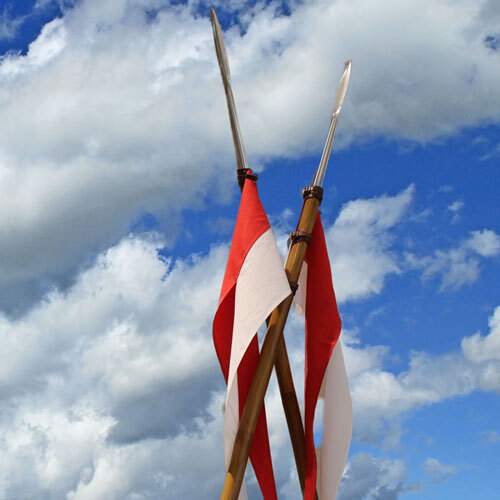 Photograph of the traditional British red and white lance pennon. On November 21st 1921, with the approval of King George V, a Canadian proclamation assigned red and white as the official colours of Canada and they were used for the pennon. Just to be different, apparently “Depot” when they put on a ride they used blue and yellow to make them distinct from the crowd at “N” Division. So many pictures back then were in black and white and the colour of the pennons would not be noticed. A detailed history of the RCMP Musical Ride can be viewed here.